IBM Intelligent Operations Center provides operational insight to help city leaders build and manage a safer, smarter city. IBM Intelligent Operations Center integrates systems providing visibility into overall city, and underlying agency status, and helping optimize operational efficiency. Integrated data visualization, real-time collaboration, and deep analytics help city agencies prepare for problems, plan for growth, and coordinate and manage response efforts. As a result, leaders can effectively deliver services in a more sustainable fashion, enhancing the ongoing efficiency of city operations while protecting citizens and driving economic growth. Integrate data sources in near real-time to create multifaceted situational awareness of city resources & events and create a collaborative environment for planning, monitoring & sharing information. 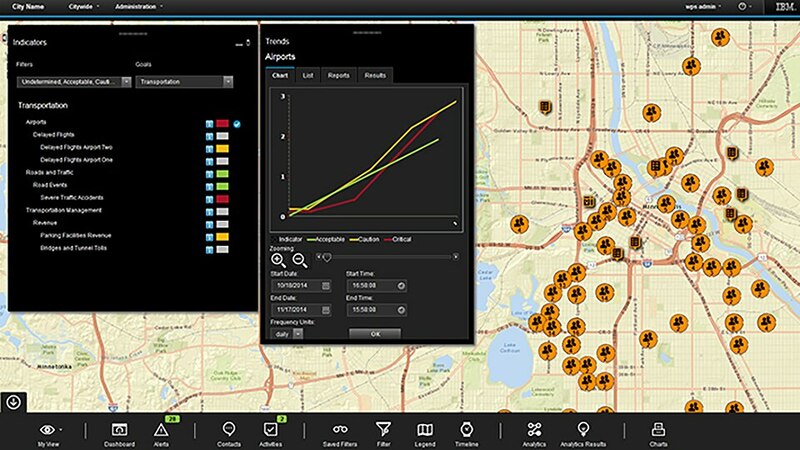 Create predictions based on historical city data & identify new patterns using advanced analytics. A status dashboard & trend analysis tracks progress of city goals as you gain understanding. Notify appropriate responders and stakeholders with a personizable notification system and automated actions. Standard operating procedures (SOPs) ensure no steps are missed.